T.H.E.M. IS CREATING NEW OPPORTUNITIES WITH SINGLE-SERVE FLEXIBLE PACKAGING AT PACK EXPO 2018 - T.H.E.M. Technical Help in Engineering and Marketing (T.H.E.M. 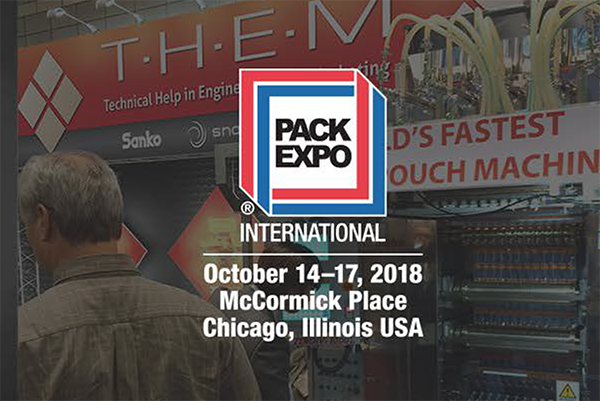 ), leading North American provider of single-serve flexible packaging solutions, and the exclusive North American representative for Sanko Machinery Co., will feature two new, high-performance machines at Pack Expo 2018. The Sanko FC-1000. This 16-lane, high-speed powder stick packaging machine has been introduced with new features for enhanced efficiency and simplified operation. The Sanko FR-3. It’s the fastest liquid pouch machine of its kind in the world. The FR-3 now has even more features for greater versatility. Technical representatives will be on site to present and discuss both Sanko machines which will be in operation throughout the show at the T.H.E.M exhibit. The New Sanko FC-1000: The Next Level of Stick Pack Machine Performance. Sanko FR-3: A Decisive Advantage for Brands Marketed in Liquid Pouches. Capable of operating at speeds over 230 cycles per minute, the FR-3 is the fastest liquid pouch machine in its class. The FR-3 is available in narrow web and multi-lane configurations, and can be set up for both three- and four-sided form-fill-seal packaging of liquid products. “The latest FR-3 model is not only fast but incredibly versatile with highly intuitive controls,” commented Kozarsky. It can run viscosity ranges from water to thick pastes with the same pumping system and from 1 ml pouches to 500 ml with no major machine changes. In fact, most adjustments: bag length, I-notch positioning, perforation, fill volume and cutoff can all be made via a simple touch panel display. Additional adjustments can be made in a similar fashion, even while the machine is in operation. The FR-3 is well suited to package soup concentrates, toppings and salad dressings, in addition to cosmetic and personal care products. The adaptable system accommodates liquid filling for a broad range of consistencies, including gels and pastes, while a proprietary ultrasonic system allows sealing of products containing particulates. For more information on these machines or to schedule a time to meet with us at the show, please Contact Us today.